This home has plenty of built-in character that makes it unique to the MM family. From the brick entrance to the two-toned cabinetry, it was a fun build that beautifully reflected the homeowner's style. This was easily one of our favorite parts of the house. The brick is a welcoming surprise to guests who walk through and adds the perfect amount of warmth as soon as you step over the threshold. 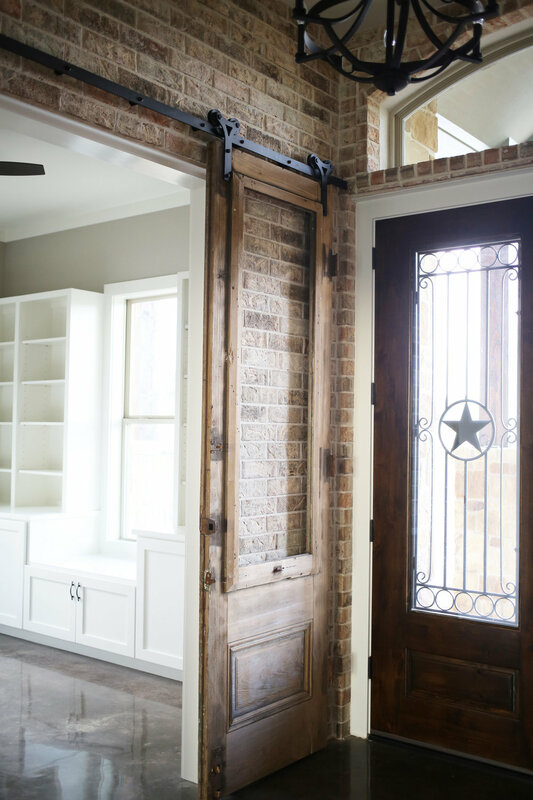 The salvaged doors on track hardware are a beautiful addition that lead you into the home office. This whole space is a great example of how to add personality to an entrance. The appliances are GE Pro series and fit the style of the kitchen perfectly. The stainless steel stands out tastefully against the white of the subway tile and the dark stained cabinet doors. 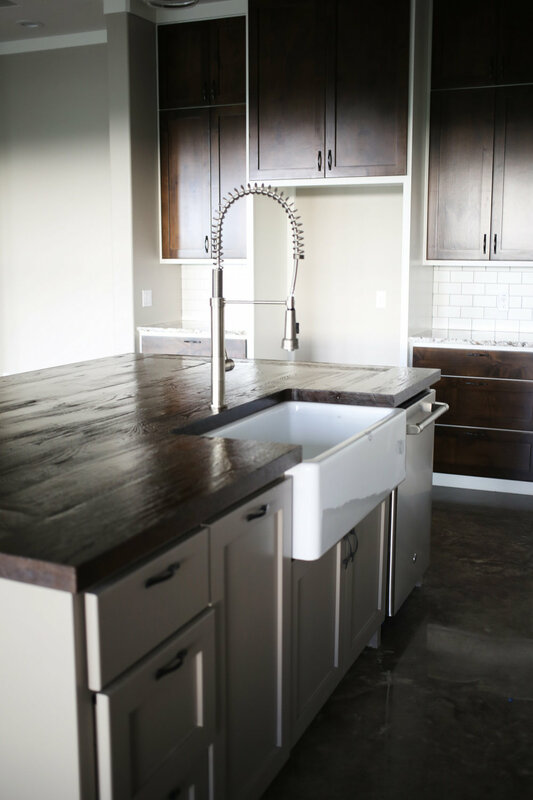 The cabinetry and island are job-built, solid wood and custom designed for this home. Our favorite feature in this space, however, is the over-sized island that is great for extra seating and provides plenty of additional counter space. All of the doors in the house are 8 foot, including the pantry, which accentuates the 10 foot ceilings. The added height is great trick to make a space feel larger than actually it is. The painted island is just a couple shades darker than the interior walls through out the house so the kitchen feels like the perfect continuation of the home. The end result is a gorgeous, practical kitchen that our clients will feel great entertaining in. 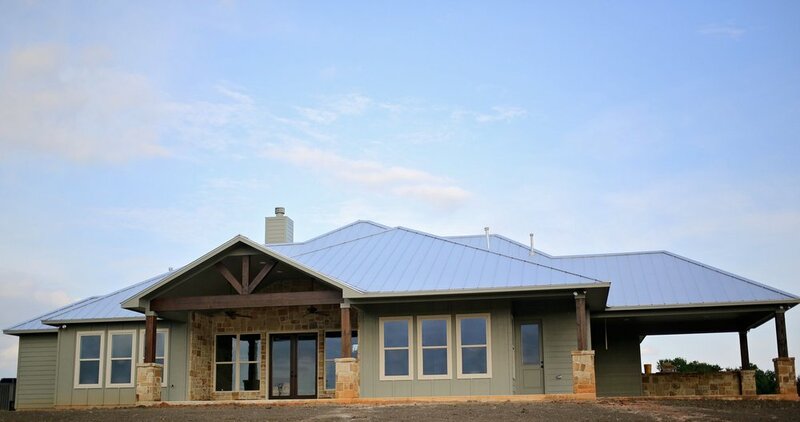 The exterior is a mix of stone, hardie siding, and board and batten. Cedar posts and gables accentuate the front and back porches. 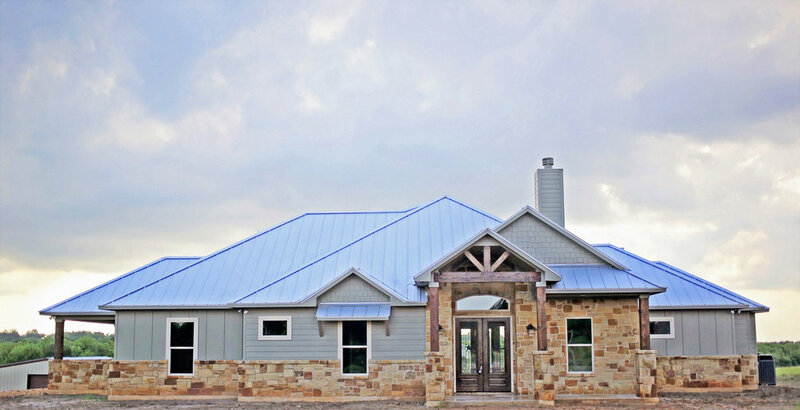 The roof is standing seam, metal galvalume which will last the homeowners for the next 50 years or longer. An Austin stone fireplace is the focal point of the living area with a large stained mantle that mirrors the beams above. Wall-to-wall windows offer a view of the beautiful acreage behind the home. Other features that we loved about this place include the built-ins in the office space and closets. 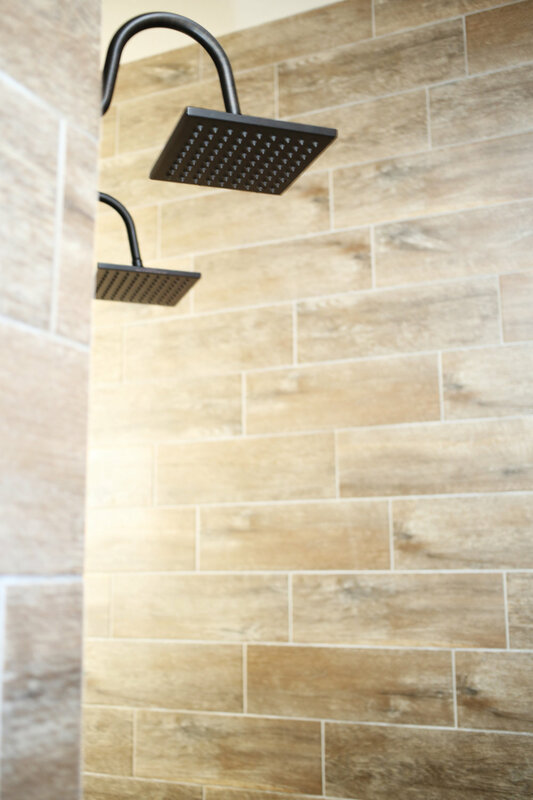 The couple wanted double rain shower heads in their luxurious master shower that is tucked in the corner of the bath with a walled entry so shower doors or curtains are not necessary. Lastly, the laundry room offers additional storage and privacy in the back of the house away from the main living space. Each of these features were designed to fit the needs of the MM family and we love the finished product. Let us know what you think of this project!